Made of strong, durable and water resistant waxed canvas . This high quality rugged utility apron is built to last for tough jobs. Tool apron with pockets, utility apron for tool shop, perfect for for carpenters, woodworkers, woodcraft and woodturning, woodshop, workshop, painters, men's apron, woodworking tools and so on. We focus on durable materials and functional design,make your work easier . Long tie straps more suitable for you . Durable & water resistant 16 oz wax infused canvas.We believe in products that are built to last. Comfortable-Our adjustable cross back strap design can Prevent neck pain. Full coverage bib apron is 27 inches wide x 34 inches tall for unisex sizing (recommended for 5' 2" or taller individuals). UNTILITY TOOL POCKETS - You can release your hands , hold the tools ,nails ,pens,phone in the pockets. 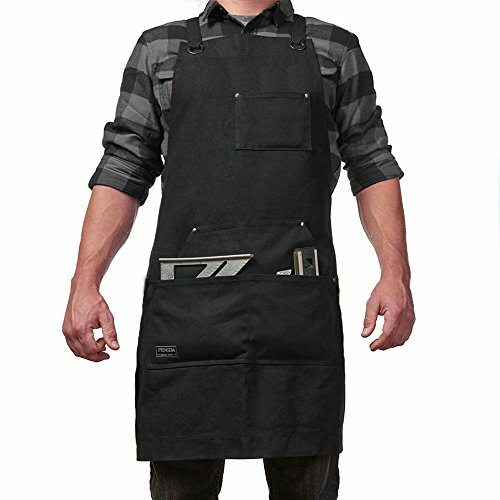 BROAD USE: Tool apron with pockets, utility apron for tool shop, shop apron for craftsman,gardening ,carpenters, woodworkers, woodcraft and woodturning, woodshop, workshop, machinists, electricians, man apron, tattoo artists, bartenders, metalwork, butchers, painters, men's apron, woodworking tools, master technicians, apron for men, protective clothing, etc. Unique gift for guys and fathers. If you have any questions about this product by Dadidyc, contact us by completing and submitting the form below. If you are looking for a specif part number, please include it with your message. FLEX BACK X-RAY PROTECTIVE APRON - PETITE 20" X 32"